The String Family is a family of classically trained musicians who toured Australia full time from 2015 through 2018. They have created a show at Paronella Park in Far North Queensland, performing every night from 1st May to 31st October 2019. We recorded The Last Post at the Australian War Memorial for the 100 year anniversary of the Armistice to end World War One. 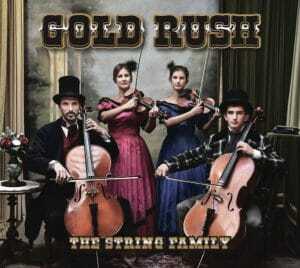 Gold Rush - Out Now! Our latest album is now available for immediate delivery! For a limited time, order three String Family albums for only $50, or all four for $60 with a bonus documentary DVD. We’ve spent the first 5 months of 2019 working on a new show to be presented nightly at Paronella Park in FNQ, from May 1st to October 31st! For booking enquiries after this date, please check our online itinerary and if we are available, get in touch. Or, get in touch anyway! See where we’ve been and where we’re going! Our 2015-2019 Australia tour is over, and here are the final numbers on our amazing adventure around Australia that saw us perform over 350 times to small campfires in free camps, to the Sydney Opera House. Thank you to everyone who supported us along the journey! Our documentary is available online – get a glimpse into the lives a family of full time travelling musicians. The technical brilliance and musicality of the first violinist is perfectly matched by the unspoken communication between her and the other ensemble members. The often throbbing ostinato of the two cellos brings an energetic intensity that breathes new life into familiar classical themes. This highly polished and exciting quartet will bring audiences to their feet calling for more. Refreshingly, this quartet actually gives modern audiences what they crave, great music played with style and passion. An entire community inspired by the unique performances from The String Family. From many hundreds enjoying their opening night performance, this grew to many thousands at appearances over the following week as word quickly spread of the sensational sounds provided by this musically brilliant group. At each, it was so warming to hear deafening applause, a true signal of appreciation for the quality of performance. An amazing family, Stanthorpe has fallen in love with The String Family, their music and the promise that there will be return visits – we can’t wait! Contact us by email, phone or on facebook. We look forward to hearing from you!